Wild Rumpus, Mission: Ammonia dress rehearsal, September 24, 2016. World Premiere: September 24, 2016. Wild Rumpus. San Francisco State University. 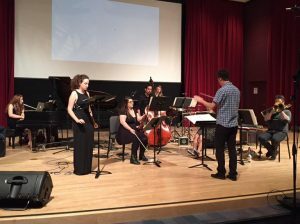 This commission was made possible by the Chamber Music America Classical Commissioning Program, with generous funding provided by The Andrew W. Mellon Foundation, and the Chamber Music America Endowment Fund. This 25 minute work for soprano and ensemble tells the story of an intergalactic salesperson on a mission to the planet Ammonia in order to sell a remarkably powerful cleaning solution. While attempting to do her best at this rather mundane job, our protagonist is simultaneously experiencing an internal spiritual and moral crisis. This inner turmoil is reflected musically with wild and noisy material and fragmented, percussive vocalizations while the main narrative is sung using a more traditional melodic and harmonic idiom. The primary text was written by songwriter and artist Jesse Rimler, with additional fragments extracted from Super Bowl TV commercials and leaked U.S. government documents, including the Bush administration memo justifying the use of torture and the Obama administration memo justifying the assassination by the government of American citizens living abroad.